In December 2017, TIMAC AGRO España has launched the solidarity initiative “Fertilizers against Hunger” in support of Action Against Hunger. This action aims to fight hunger by improving access and management of agricultural resources production and livestock production in the most disadvantaged areas. 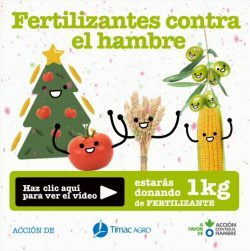 TIMAC AGRO España is committed to offer 1 kg of fertilizer for each sharing of the solidarity video created for this initiative. The video, available since December 12 on the YouTube channel of TIMAC AGRO España, aims to raise awareness and involve the company in this cause. FAO warns about the progress of hunger in the world. After nearly 10 years of progressive decline in global malnutrition, the FAO report, released in September 2017, reveals that 11% of the population suffers from hunger, which represent 815 million people, 38 million more than the previous year. According to the FAO, 50% of the world’s agricultural and livestock production is achieved through the appropriate use of fertilizers. Therefore, its promotion contributes directly to the fight against hunger. The video quickly became viral with more than 8,500 views in just 13 days. Various associations, media, companies of the sector, distributors, customers and collaborators of TIMAC AGRO didn’t hesitate to join the cause which in a few hours was shared through the different social networks. A satisfying start for a video aimed at raising society’s awareness of the problems of hunger, food insecurity and malnutrition. This action marks the beginning of a relationship between the two organizations in their attempt to contribute to the improvement of agricultural and livestock production in the most disadvantaged areas and, consequently, to the fight against hunger.